Early detection of eye conditions is a key factor in mitigating symptoms and achieving the best possible outcomes for patients. There have been diagnostic options available for years that can show some of the picture as to what is going on. However, emerging technology has created better, faster, and stronger methods for detecting eye conditions and assessing overall eye health. One such piece of technology, which we recently purchased and installed in our Salem, Virginia office is the Optical Coherence Tomography (OCT) device. We are one of the first optometrists in Southwest Virginia to have this piece of equipment and to be able to offer this state-of-the-art technology to our patients. The exact OCT make and model we purchased can be found on the International Space Station and is being used to assess astronaut’s eyes in the weightlessness of space. So how does Optical Coherence Tomography benefit those of us on planet earth? Great question! The OCT is able to take measurements down to 3 microns, which is a third the size of a red blood cell. Until recently, this detailed examination of the human eye was only possible by taking a cross section of a deceased person’s eye and using a microscope to study it. Now, with this “living microscope” it is possible to examine living tissue in real time—it’s amazing, absolutely amazing! From start to finish this procedure takes less than 5 minutes and doesn’t require dilation. The area scanned is the retina and the optic nerve; this exam can even detect “floaters.” This cool (safe) laser is able to produce 3-D images as it takes hundreds of measurements per second. Those measurements and images allow doctors to examine the eye section by section. This powerful diagnostic tool is especially useful for assessing glaucoma, diabetic eye disease, and macular degeneration. Within 36 hours of getting our OCT up and running Dr.Gudeman had already incorporated results from the OCT into three different patients treatment plans. Our staff was interviewed by WSLS about our new technology and how it is going to benefit our patients. We’d love for you to check it out (hint: Dr. Gudeman and Dr. Scott both got a moment in the spotlight!). If you have a family history of macular degeneration or glaucoma we recommend this exam to establish a baseline–even if you aren’t experiencing any symptoms. Additionally, patients with diabetes should have an OCT scan completed. We certainly hope our patients never begin to develop eye conditions but do want to be vigilant and prepared with data should something begin to develop; preserving vision is a quality of life issue. It will help us to have those images on file as you age and your eyes change. Image Source: Teague, Bethany. 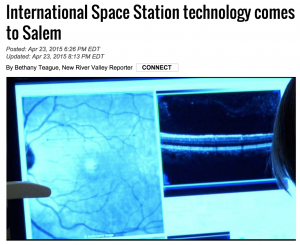 “International Space Station technology comes to Salem.” WSLS.com. April 23, 2015. Screen shot captured May 6, 2015. Next: You’ve Done It Again!